Iranian Holocaust Denial Conference Draws Strange Bedfellows……. – The Tundra Tabloids……. Iranian Holocaust Denial Conference Draws Strange Bedfellows……. 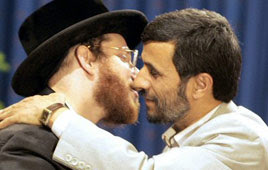 Iranian President, Mahmoud Ahmadinejad’s “Kiss of Friendship” with a member of the notoriously anti-Israel “Neturei Karta” symbolizes the bizarre atmosphere at that festival of hate, bigotry and racism. Holocaust revisionists from around the globe flocked to Iran for a chance to air their despicable views, and to “rub elbows” with fellow Holocaust deniers. This is all very disgusting and hurtful to all who have lost family members in the genocide of European Jewry during WWII, the Jewish Holocaust, as well as dishonoring their collective memory. Denying the Holocaust only helps to feed anti-Semitism which will encourage more acts of violence to be directed against Jews. That these marginalized Ultra-Orthodox Jews participated in the conference is indeed regrettable, because it appears to give a certain degree of credibility to the thoroughly discredited phenomenon of Holocaust denial. I wonder if being a Jewish “dhimmi” is worth the price for the ends justifying the means? Al Avai adds: Even as Iran is denying the Holocaust and threatening a nuclear version of the same, it is refreshing to see that some Jews appear to take the “forgive and forget” attitude. “The Presidency of the European Union is deeply concerned about the Conference on the Holocaust, which was held in Tehran on 11-12 December 2006. The Presidency regards the holding of the conference as detrimental to efforts aimed at furthering the dialogue among civilisations, cultures and religions. The Presidency condemns in the strongest of terms any politically or racially motivated attempts and the use of pseudo-scholarship to deny or question the Holocaust and is disturbed by the continuous efforts of the Iranian government to question or trivialize the undeniable historical facts of the Holocaust and its horrors. “Israel’s Chief Rabbi Yonah Metzger called on world Rabbis to reject Neturei Karta members who participated in the Holocaust denial conference in Iran , saying they “sabotaged Israel” and should not be allowed entrance to Temples. “They betrayed the Jewish people and their heritage and particularly disgraced the Shoah and desecrated its memory. They tried to stain the Jewish people, who shy away from this low behavior, with their shameful behavior,” Metzger said. The chief rabbi called on all communities in Israel and around the world to reinforce the memory of the Holocaust amongst their community members. This dramatic step was significant because boycotts are rarely done, and only as a last resort.” More here. Previous Post Previous Post Useful Idiots For Islam……. Next Post Next Post Finnish State TV YLE Purges Terrorist Image From Fatima……. With all due respect, that statement is absurd. The fact of the matter is that Jewish intolerance towards honest scholars, researchers and average citizens who have legitimate questions regarding the Hollywood version of WWII and the supposed genocidal gas chambers is a primary cause of modern anti-Semitism and only contributes to the historical distrust many Europeans have for the Jews who live among them. Common sense and a sobre reading of history informs us that criminalizing legitimate inquiry, free speech and peaceful dissent inevitably leads to violence opposition.